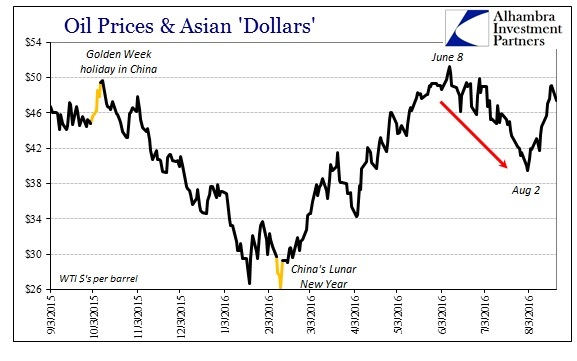 Starting June 8, oil prices began falling again, reversing their more optimistic trend that had lingered since February 11 long after the usual correlation to CNY was broken. In fact, by the time WTI had peaked, CNY was already being meddled with again in clear PBOC interference. Despite being backward to what was 2015’s relationship of death, by July the oil price drop was something to behold; it was a regular, daily occurrence that escaped the mainstream’s ability to define (since it was contrary to the spring rebound narrative). After falling below $40 (closing price) for the first time since mid-April on August 2, however, there seems no stopping the buying. As it went down in nearly a straight line it has come back up just as intensely, if not more so. What changed? Many are claiming that it was merely a typical correction on the way to much higher oil prices as the global economy will look like what the FOMC and Janet Yellen describe. Because there is no other economic data anywhere in the world that even indicates that as a possibility (except the isolated unemployment rate and the media’s tendency to attach the word “strong” to anything even when highly inappropriate in doing so) we are left with the “dollar” – and very likely the Asian “dollar”, just not via China like last year. Back toward the end of June, Bloomberg reported yet another increase in the negative spread for yen basis swaps into dollars; this time even more intense than the burst that ended on February 11. Starting on June 8 (first clue), the basis swap plunged from around -48 bps (which is already a very “tight” starting point”) to -68 bps at the time the article was written. That was the most “dollar” deficient since November 2011; i.e., intensification of the “dollar shortage” vis a vis Japan and yen. We already know well the direct relationship between this angle of a “dollar” problem and JGB yields. Referring back to mid-March for the second time today, JGB yields were trading below the NIRP penalty because of this inordinately large premium in basis swaps (from the point of view of holding spare “dollars”). In other words, if you have “dollars” you don’t care about what you do with the yen you swap into; park them in negative yielding JGB’s because the negative basis swap is so favorable to anyone with “dollars” (FX leverage) the cost of the negative yield is nothing compared to the swap premium (again, from the perspective of the “dollar” holder). The very fact that this negative basis swap persists and does so at increasing record levels demonstrates very plainly what I was writing about earlier today in diminished balance sheet capacity in money markets related to Japanese banks – FX included in those money markets. With that in mind, there is then a very good relationship between the basis swap spread (negative) and JGB yields. 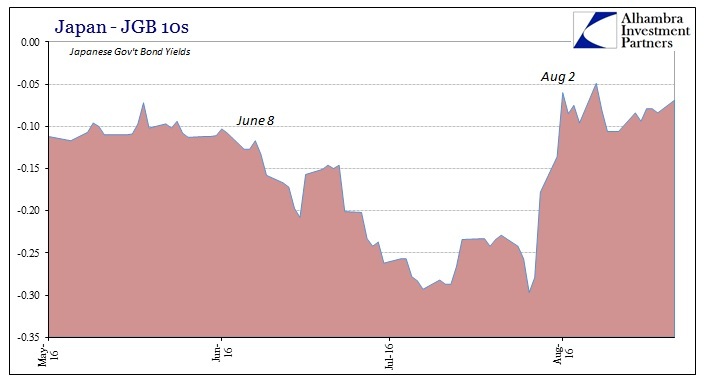 Around June 8, as the spread began to sink, so did yields especially in the JGB 10’s. By the time the Bloomberg article was published, the yield was a ridiculous -20 bps and double the penalty rate of NIRP at the 10-year maturity. It would continue to get worse as by July 27 the JGB 10s were yielding a flat-out stupid -29.7 bps, cross currency basis swaps sinking toward an unbelievable -80 bps. The very next day, JGB’s sold off, with the 10-year maturity jumping to “just” -27.9 bps. On July 29, however, yields rose sharply with the 10s finishing that day at -17.8 bps. July 28 and 29 should sound familiar as all eyes had been on the Bank of Japan ever since the “helicopter” rumors started flying earlier that month. Those days were the actual policy meeting where, to the mainstream, BoJ massively disappointed. That day, however, I wrote that, as usual, the mainstream was wrong because it was looking in the wrong place. I don’t want to make too much in comparison to their reluctance to add to QQE, but it isn’t nothing that when the entire world expected them to act they did so where they did. It is an acknowledgement, I believe, that one of Japan’s most pressing issues is “dollar” and not just its own economic disaster.  After all, Japanese companies that have been for decades upon decades financing in “dollars” have done so via Japanese banks. For the BoJ to step in for them at all confirms a great deal about what we long suspected with regard to the world’s biggest problem. The one-year dollar/yen basis swap spread , or the cost of swapping yen for dollars for a year, dropped to around 70 basis points from around 77 basis points before the BOJ decision. That last part is what you see in the huge selloff in JGB yields that extended to a second day on August 2. In short, the Japanese end of the Asian “dollar” had become distressingly disruptive through June and July, but much less so once BoJ singled out the “dollar” in its actual policy changes. 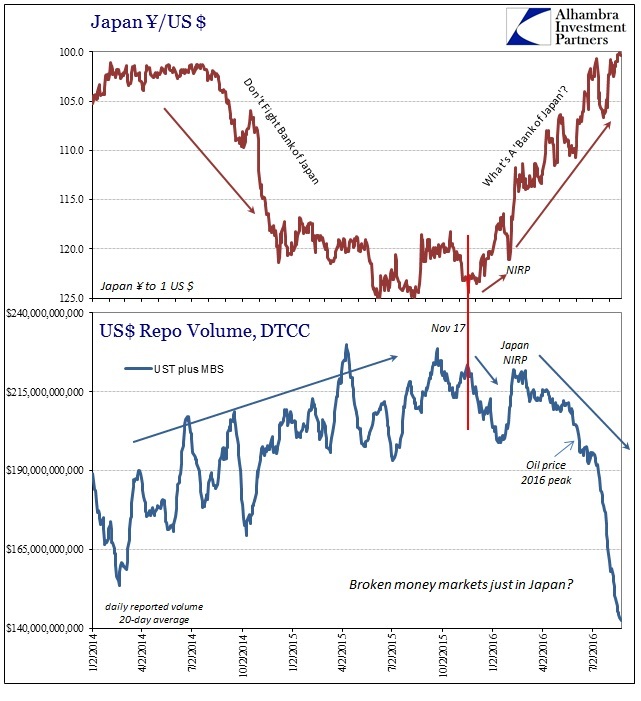 Thus, from around June 8 until about August 2, the Japanese-connected “dollar” pressure was increasingly acute and globally disruptive (stock markets obviously notwithstanding because of their own liquidity supply and buying interests, largely myths about what central banks can’t do). Since August 2, much less so; leaving oil once again as a function of “dollars” this time in relatively better shape. That is only the short run, however, lest anyone get carried away being impressed by BoJ finally doing something immediately effective. It hasn’t helped JPY, which I still believe was their intention. Though you could argue there has been some positive spillover in that the yen exchange rate seems stuck around 100 rather than moving sharply upward into the 90’s once more, it isn’t anything like a reversal which you have to believe was hoped for. The same goes for the negative basis swap; it may have moved less negative (less “dollar shortage”), but the spread is still near record wides. The policy, therefore, was only marginally effective in at most the short run of arresting the “dollar” pressure of June and July (you will notice how little effect the “helicopter” rumors had in this regard, which someone could argue was the point of those curiously placed whispers in the first place, at least trying to have a large effect on the FX shortage into JPY). The overall global condition, as we know through repo and LIBOR, remains. As with so many PBOC intrusions these past few years, BoJ has bought only some time and likely not all that much, changing very little in the process. Without the proper perspective, all these things are but a mystery that never gets solved. Oil is “dollars” and increasingly “dollars” is Japan. While that may seem like a relief given last year’s story of oil and China, it is not, in fact, a positive development.